Led by the University of Alabama Birmingham’s, Comprehensive Cancer Center and Alabama Extension’s Homes Grounds Team, Harvest for Health uses a backyard garden to teach new, healthy habits to cancer survivors. Extension trained Master Gardeners mentor the cancer survivor to learn vegetable gardening. The initial study’s results showed cancer survivors ate more vegetables, improved their strength and flexibility, were more motivated to daily exercise, and had other positive health indicators. Partially funded by the National Cancer Institute, a larger, follow-up study (2017-2021) plans to repeat these results. You can join our project! The funding award is short of our total budget. Please contact Kerry Smith, smithkp@auburn.edu to sponsor a kit ($420). If you are a cancer survivor or know someone who is, and want more information about our Harvest for Health study, please call 1-800-476-9478 or email harvest4health@uab.edu. 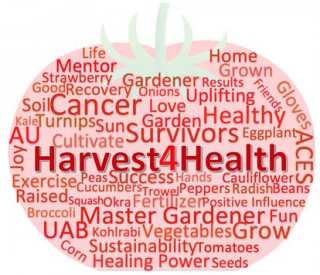 Harvest for Health study, please call 1-800-476-9478 or email harvest4health@uab.edu. Please join our private Facebook page. Contact Kerry Smith or Renee Thompson for more information. Join group discussions and share what’s happening in the garden! The Alabama Cooperative Extension System provides a substantial information packet to each participant and mentor in the project.